What is today known as the Father Lacombe Care Society, operators of the Father Lacombe Care Centre and Providence Care Centre began as Lacombe Home, the consummation of the extraordinary life’s work of Father Albert Lacombe, O.M.I. Undertaken at the age of 81, Father Albert Lacombe called his project and last mission his “most beautiful dream”. The Home was to serve the poor and vulnerable of society, including orphans, the elderly and the disabled. Lacombe Home was built in 1910. Working in conjunction with the Sisters of Charity of Providence, Father Lacombe intended his home as a Christian Catholic institution devoted to the care of everyone, regardless of religion. That vision continues as the core of all activities of care. The generosity of others has always been fundamental to the realization of the dream. The original land—200 acres of a ranch north of Midnapore–was donated by future senator Patrick Burns. The Province of Alberta, Lord Strathcona of the CPR and Calgary businessman J.C. Duggan were significant among those who supported the $60,000 cost of construction. When Lacombe Home opened November 9, 1910, Father Lacombe was 82 years old and lived amongst his friends and protégés as one of its first residents. Almost exactly six years later, on December 12, Father Lacombe died. He is buried in the crypt at St. Albert’s Parish and in accordance with his request, his heart remains here, in the old Lacombe Home Cemetery. After Father Lacombe’s death, management of Lacombe Home remained in the hands of the Sisters of Providence and continued to depend entirely on donations. In subsequent decades—particularly in times of poverty, war and epidemic– Providence was indeed an apt descriptor of their resources. 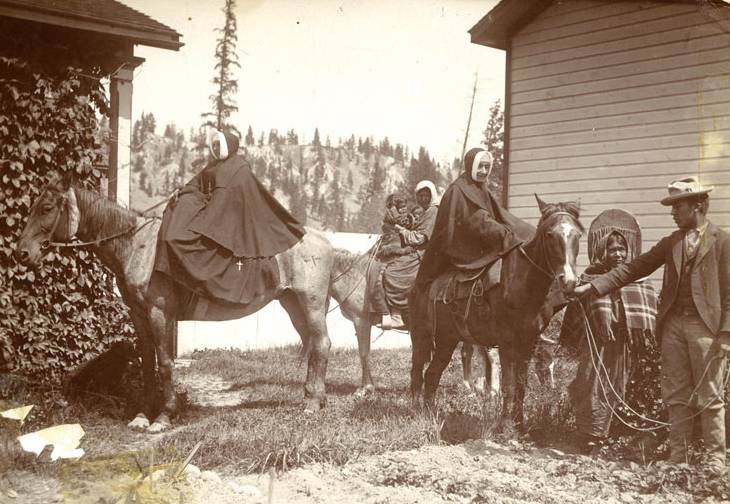 “Begging Journeys” by horseback, stage coach, wagon, river boat and trekking and early letters home –“begging letters” were commonly done by the Sisters. They collected everything from precious gold dust and nuggets, monies, basic supplies like oil for lamps, school supplies, toys, musical instruments, cloth to make clothing for the needy and to maintain and operate the facility. Donated deliveries included everything from pigs and produce to such largesse as a piano and even a car. The introduction of public health care improved financial matters, although quality of life at Lacombe Home continued to be sustained by generous community support. Over time, out buildings were built on the land by Lacombe Home including a laundry and barn. In 1921 a large wing was added to Lacombe Home, and in 1956 Providence School was built on the south edge of the site. A novitiate became part of the north site in 1958. In the late 1950s and early 1960s a new trend in social services meant the orphanage of the original Home would no longer be necessary. The last children left in 1963. Shortly afterward, in 1966, the elderly were also moved to the new Father Lacombe Nursing Home, built just east of Lacombe Home. That same year the Sisters of Providence moved their headquarters to Edmonton, and the Providence Convent was built to house the sisters who remained. The site of the old Father Lacombe Home was sold to Faithful Companions of Jesus, who operated a school and used Lacombe Home as a boarding house. 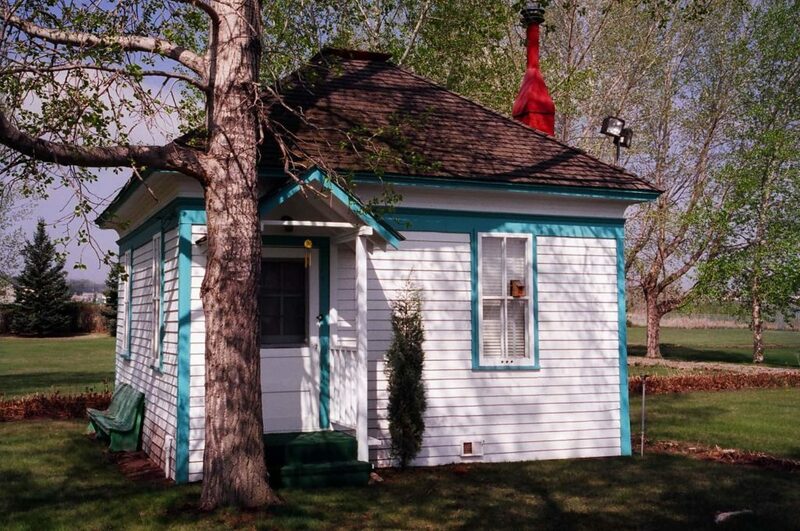 That school closed in 1968, and the home remained vacant for several years until it was sold to the Catholic Diocese of Calgary. The creation of the Inter-Faith Lacombe Centre in 1974 allowed the Home and other buildings to be used by various organizations, but the buildings eventually fell into disrepair and were effectively abandoned. The site of the current Father Lacombe Care Centre is still owned by the Sisters of Providence. 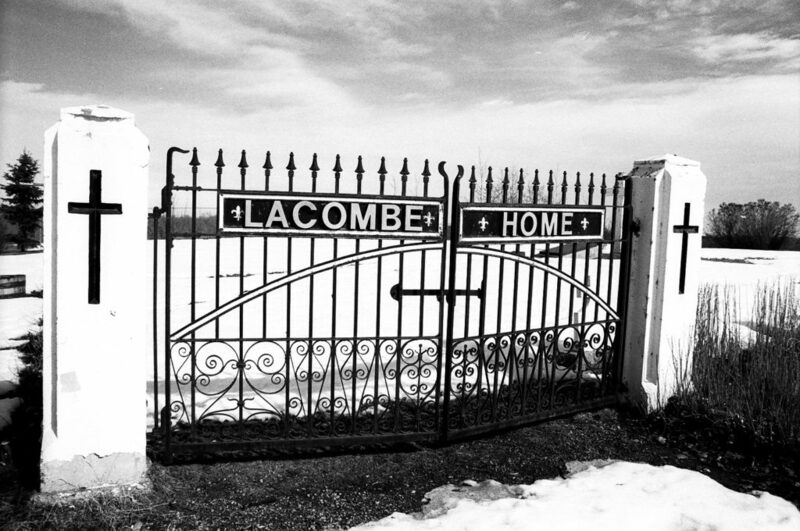 In 1979 the original Lacombe Home was designated a provincial historic site, while the new Father Lacombe Nursing Home forged into the future with the opening of a new dementia wing in 1980. Further renovations on the Nursing Home were undertaken in 1991. Sadly, on April 1, 1999 Lacombe Home was destroyed in a fire, and a city landmark and important piece of Alberta’s heritage was lost. The original vision, however, is intact: in May 2002 Father Lacombe Nursing Home changed its name to Father Lacombe Care Centre, and is presently home to 114 residents. Almost as many others form an extended community as participants in the Adult Day program. The little white convent that housed the Sisters during the building of the original home remains on Providence property, a treasured reminder of an extraordinary history of care. Original house the Sisters settled into. Now on the Covent property. January 2016 the doors opened at Providence Care Centre, our new 160 bed facility, directly across from the Father Lacombe Care Centre. This open, spacious facility is home to residents requiring long term care, dementia care, supportive living (SL4) and supported living-dementia (SL4D).